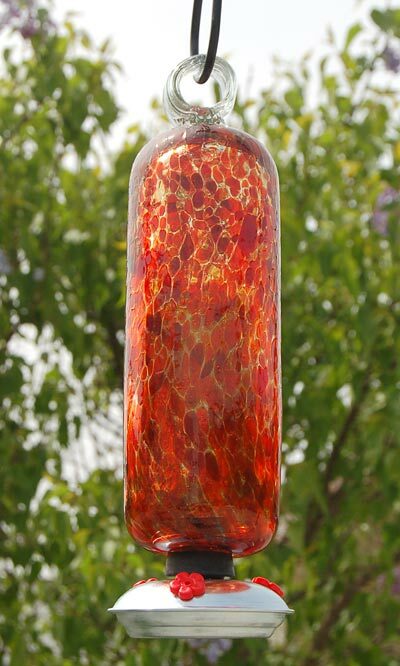 Delight the hummingbirds in your area using the Parasol Red Cinnabar Filigree Hummingbird Feeder. The speckled red and orange colors around the cylindrical reservoir add an ornate and vivid touch to your garden easily. This tall reservoir holds up to 20 ounces of nectar, and its metal gondola base has three feeding ports. A red plastic flower surrounds each port, blending with the reservoir and helping birds locate the nectar. A rubber stopper at the bottom of the reservoir completes the unit, and the base gondola may be removed for cleaning and refilling the piece. The blown glass loop at the top of the item enables you to hang it from its included 6" long "S" hook, for an easy display in your yard. The hand blown design of this vessel retains some of the art of its creator, and the recycled glass construction creates an environmentally sound piece. Add dramatic shape and pattern to your bird garden with this Red Cinnabar Filigree Hummingbird Feeder. This feeder works on a vacuum principle. To minimize dripping, you must fill the feeder completely with cool nectar every time you fill it. The goal is to have no air trapped inside the feeder before flipping it upside down. Note: The Parasol Replacement Feeding Gondola can be used to replace the metal base and stopper on this Parasol Red Cinnabar Filigree Hummingbird Feeder.